Aye! Time to immerse in the exotic Tiki ambiance on this sublime slot game by NetEnt. Considered the pride of Aloha Slots, the tropical reels of Aloha! Cluster Pays is the brand-new definition of entertainment. Soak up the sights and tropical delights of this Hawaiian-themed slots game. Let the Tiki guide you through all the exciting new features, to collect coin rewards and bigger wins. 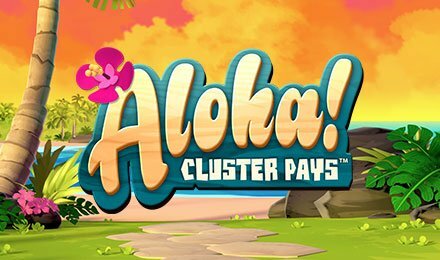 As you enjoy the tropical paradise Hawaiian scenery, explore the unique bonus features like the Symbol Drop feature which removes the low value win symbols during the Free Spins round. This original game offers no paylines, but if you land a winning combination of cluster symbols then it pays, as you can earn re-spins! The Cluster Pays mechanic feature will also boost the cluster size! So hula your way to wicked wins with Aloha! Cluster Pays!